This floral print is so light and breezy relaxation is a must. This open and airy swirly floral is such a versatile pattern to use in many decorating styles and will add that designer touch. The design combines green, blue, and yellow flowers with swirls of black. The floral pattern is set on a background of white to showcase the print. 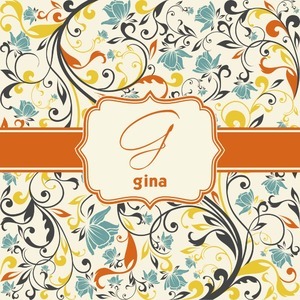 The design has a classic ribbon in orange trimmed in white. The decorative white label is trimmed in orange. Add an initial and a name for that personal touch to pull the entire design together.